Although the Midwest is beginning to experience fall’s cooler temperatures, here in Arizona temperatures are still soaring into the upper 90s and we are definitely still making good use of our air conditioning. As soon as you get in the car you can’t wait to crank up that AC. Whether you are hot and tired from work or whether you are heading out somewhere that you would prefer to arrive looking attractive rather than wilted, in Arizona air conditioning is a must. It’s also one of those perks that you don’t fully appreciate until it’s gone. When that happens you often find yourself desperate for an auto AC repair mechanic. The hotter it is the more difficult it is to get an appointment to have your auto AC repaired. So if you notice any of the following problems, make an appointment with an Arizona mechanic as soon as possible. Better still, have your auto AC serviced by a certified mechanic before any problems begin. That’s why it’s best to maintain your car’s air conditioning and cooling system and always be on the lookout for signs of trouble. Possibly the most unpleasant sign is no air at all blowing from the vents. This could point to a problem with the dashboard control switch, damaged cooling fans or simply stopped up vents or a blown fuse. Another dreaded problem is turning on the air conditioning only to have it blow hot air instead of the icy blast you were looking forward to. The most common cause is leaking refrigerant. You will want to visit a mechanic for auto AC repair as soon as possible for two reasons, firstly because it’s way too hot to be without air conditioning, and secondly because leaking refrigerant can damage the ozone. Your car’s air conditioner requires refrigerant in order to work. When the air coming from your vents isn’t as cool as it used to be you should take your car to a mechanic for auto AC repair. Your car’s air conditioning is a sealed system, so if you are low on refrigerant that usually indicates a leak somewhere in the system, although it can be something as simple as a bad thermostat. Most leaks are small and difficult to locate, which is a good reason to take it to a professional mechanic for an AC performance check. Just to throw in an added warning, it is illegal to service your own refrigerant. The most commonly known refrigerant is Freon, also known as R-12. Freon was banned around 1995 due to the EPA’s discovery that it damages the ozone layer. Auto AC repair shops must be licensed to show that they have the proper means to safely dispose of Freon. Now the coolant of choice is the CFC free R-134a. Since the elimination of CFCs by the EPA the ozone layer has begun to recover, and according to the EPA, the ozone holes caused by CFCs are expected to be completely closed by about 2050. Now an even safer refrigerant known as HFO-1234yf refrigerant has been designed. When you turn your car’s air conditioning on, pay attention to any strange noises it makes as these can be indicators of problems. It could be anything from a loose or broken belt on the compressor to almost any part being worn out and ready to break. A bad belt can prevent the compressor from cooling or circulating the cool air. If your air conditioner is making strange noises, it’s best to take it in for auto AC repair right away before it gets worse. A bad compressor can cause a lot of damage. When you turn on your air conditioner, if you are hit with an unpleasant musty odor it can be a warning that there is a buildup of bacteria or mold growing in your cooling system. Ugh! This is a problem that requires immediate attention since it involves health risks and may lead to respiratory difficulty or illness. Furthermore, if you smell or see any leaking coolant you should take your car into your Mesa auto mechanic to locate the source. Be aware that coolant can also leak on the inside of the car if you’re heater core goes bad. Leaking coolant gives off a distinctive, sweet smell. Regular maintenance and early detection of problems are key in keeping your air conditioning humming along. In addition, properly maintaining your cars cooling system according to the manufacturer’s maintenance schedule for your particular vehicle will help to head off air conditioning problems. Scottsdale Muffler & Automotive’s licensed mechanics routinely use computers to quickly diagnose auto air conditioning problems. 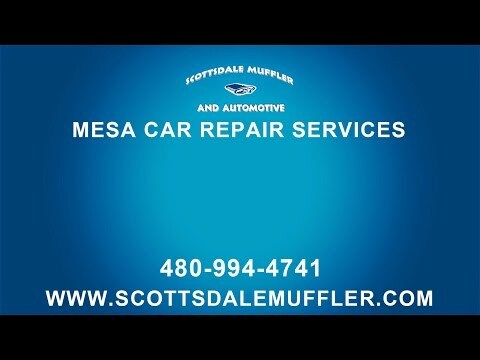 Scottsdale Muffler & Automotive has a reputation as the most qualified, honest and friendly Mesa car repair service in Arizona! Call to schedule your AC and cooling system maintenance today. Scottsdale car repair shop and Tempe Arizona auto mechanics, repairing vehicles of all makes and model.